I just stumbled upon a year-old YouTube video named, “Sam Harris gets destroyed by Dr. William Lane Craig”. It’s the 2-hour University of Notre Dame debate held on April 7, 2011, between Harris and Craig. It was titled: “The God Debate II: Is Good from God?” The video can be found at the bottom of this page. And guess what? Harris really was destroyed by Craig! What a disappointment. Craig started off with the premise that objective morality can only exist if God exists and, alternatively, if God does not exist, objective morality can not exist. Harris then presented his premise that science can identify objective morality by determining what contributes to the well being of conscious creatures. Craig rebutted with a scholarly evisceration of Harris’ premise that cited: the absence of moral objectivity in atheism; the subjectivity of human flourishing; the is/ought distinction; and more. As Harris walked up to the podium for his own rebuttal, I realized that he CAN’T rebut Craig because he agrees that there is an objective basis for morality: namely the application of science to the question of human flourishing (well being). And sure enough, Harris didn’t counter a single Craig rebuttal. Instead, he launched into his usual attack on the Bible and its morality. In disgust, I stopped watching when Craig came back to the podium and rightly pointed out Harris’ lack of a rebuttal. Harris was so invested in his flawed thesis that “science can solve moral problems” that he was blinded to the risk of agreeing that morality is objective. The fact is that Craig is right! Objective morality can only exist if God exists: if God does not exist, objective morality can not exist. The atheist position should have been that objective morality can not exist because God does not exist. In other words, morality is subjective. If atheists do not believe in God and the supernatural realm, that leaves only the natural realm: the universe and everything in it. Nature has only a prime directive: survive. There is no good or bad, right or wrong, in nature. Morality is a human construct and, as such, can never be perfect – because humans can never be perfect. Human morality can never be objective: that would require a perfect God, a perfect authority. Harris should have had a 2-pronged strategy: 1.) point out the lack of perfection in the biblical God and 2.) provide a naturalist understanding of morality; admitting up front that it is subjective and relative but, in the end, far superior to the flawed morality of an imperfect God. As atheists, we’re familiar with the myth of God’s moral perfection so I won’t go into much detail except to flesh out the slavery criticism because it’s upheld in the New Testament as well as the Old. I’ve recently written on the naturalist understanding of morality. If the following is familiar to you, just skip to the end. The naturalist understanding of morality asserts that we have evolved empathy as an impetus to cooperation. Combined with personal experience, empathy leads most of us to a "Golden Rule" sense of morality. From experience, I know what hurts me: with empathy, I know the same things likely hurt you too. Experience and empathy is all we need to decide most moral matters. "Do unto others as you would have them do unto you . . . because we need each other to survive and prosper." We are complex social animals, so this rule of thumb isn't sufficient for every moral decision but it is fundamental to most. Without this impulse for cooperation to counter our impulse for violence, we would probably squander the intellectual prowess responsible for our survival advantage. It's a fallacy (with obvious religious motivations) that “we can not be moral without God”. Our morality is part of the human condition and existed long before Moses. Morality is not a dispensation from God: it is subjective and personal and, because it is informed by experience and empathy, develops as we mature. As a matter of fact, we ALL use our personal morality to overrule Biblical morality. And by ALL, I really do mean ALL: believers and nonbelievers alike. This fact is amply demonstrated by our universal rejection of slavery and the subjugation of women (well, maybe not the Muslims so much). Even though God/Jesus condoned the subjugation of our fellow humans in both the Old and New Testaments, we ALL overrule God's morality with our own and reject such human subjugation. Not only is God NOT the source of morality but he stands corrected by us all. WE decided what is moral. WE decide what is religiously worthy. NOT God. You need to ask yourself: "If we overrule God, why do we need him at all?" This subjugation of our fellow humans is a failing of Biblical morality that can't be reasonably addressed by apologetics. This is critical for all believers to understand. THEY CAN'T HAVE IT BOTH WAYS. Either God is perfect or he's not. Either the Bible is divinely inspired or it's not. Either God is the source of morality or he isn't. Even a believer, if he’s honest with himself, must admit that if God's morality grows outdated, it was never perfect and timeless to begin with. The alternative is to claim that God is right and that the subjugation of our fellow humans is NOT at all immoral – that it is, in fact, desirable. But we ALL know that's an untenable position. We all know that is WRONG. We will not reverse our hard-earned moral progress to align it with God’s morality. This is why the issue is out of reach of apologetics. The truth is that the Old Testament, New Testament and Quran reflect the morality and level of ignorance that existed in their respective eras and areas . . . precisely as they MUST if they’re written without the benefit of God's input. These ancient tomes are NOT divinely inspired. God is NOT perfect. The issue of human subjugation proves that the personal, revealed, theist, God of the Abrahamic religions is irrefutably false. This doesn't completely close the door on God, however: there's still supernatural hope for the impersonal, cosmic, God of deists and pantheists. Empathy is a human trait that spawns a number of other human traits just as naturally as it spawns morality. Empathy also spawns human dignity and worth, cooperation and compassion. We can live reasonably moral lives without God but not without empathy. Huh?!? Are you repeating yourself or am I missing something? I've already agreed that Harris' point is "true as far as it goes" but questioned its efficacy in more complex situations -- i.e. when value judgments are unavoidable. With abortion, for instance . . . subjectivity, via value judgments, is inescapable and there's no objective standard, criteria or authority that can be maintained. The best the Supreme Court could do was settle on a "last straw" criteria of fetal viability. The morality of abortion was not settled -- it wasn't even clarified one bit. With the Palestinian problem, it's a chicken versus egg scenario. Once again, there's no objective standard, criteria, or authority that anybody can turn to. Morality is not objective. It is not the purview of science. It is subjective, relative and personal. Nobody can claim an objective form of morality because WE MAKE IT UP AS WE GO ALONG. It's a human construct. There is no objective morality to be found in nature or the supernatural. It is important only to humanity and understood only by humans. Craig is a pigeon theist. You can't win against them. 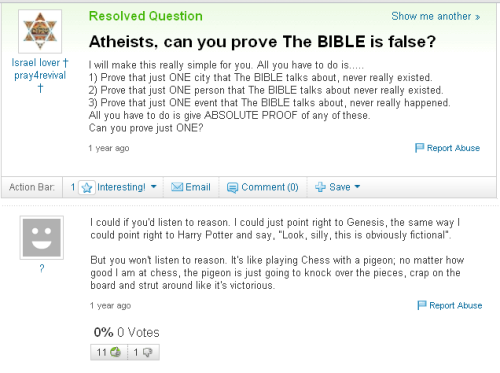 Exile, here I think we should use and spread "pigeon theist"
Well .. . I had the crapping part right! I've read that description before . . . maybe it was you. You're making it too hard. Let me give you a couple of abortion examples that are very, very easy from an objective perspective. 1) Fetus is 3-months old, well before the time such fetus could have developed mental capacities to understand things like pain. And it doesn't matter because fetus is also encephalactic, meaning it has no brain, only a brain stem. And said fetus is also going to become toxic, meaning that if mom doesn't abort the fetus, eventually the fetus will infect and kill the mother. So, mom should be allowed to abort. Easy. Simple. Logical. Objective. 2) Fetus is one week shy of being full, 9-month term fetus. Mom is told, very late in the game, that fetus is going to be a girl. Mom is very upset; she wanted fetus to be a boy. So mom wants to abort said fetus. Moreover, she want abortion to happen in a manner that is guaranteed to kill the fetus, instead of just inducing labor and giving up the fetus for adoption. So, mom should not be allowed by law to abort as she wishes. Again, simple. Logical. Objective. Sometimes as a baseball umpire, the pitch is right down the plate and waist high. Sometimes the pitch is 3 feet outside the plate. Sometimes, one can call objective balls and strikes quite easily. You ARE repeating yourself! And you're evading my questions. You're STILL simply contrasting scenarios. I'm not making it too hard at all. You're making it too simple. @Kris - Excellent points. By asserting that your assessment may not be correct, i.e. the one and only “truth”, you allow it to keep its’ objectivity. Saying your reasoning may not be 100% correct and could flaw your argument based on its complexity is not what Craig does. He always ends it in the same place. If you had been using the KSA in you argument since 1978 you would have perfected it by now. However you would also be unwilling to admit there may be flaws in it if that was the case. Are you replying to a deleted post? I can't find the John Siqueiros post you're referencing. "It seems that many people would say, first and foremost that taking a life unjustly is a crime against the one who dies, but that is irrational. Once they die, they cease to exist as a thinking, feeling human being, so how can a crime exist against a person who no longer does? It makes no sense." I'm sorry to laugh at your expense but if you don't want to be laughed at, you shouldn't say such funny stuff. The murdered victim can't complain or mourn his own death BECAUSE YOU KILLED HIM.